Come late August, downtown will be a bit busier when the Saint Louis University academic year begins and its Law School opens the doors on its new downtown location. Announced with surprise and excitement only 2 weeks ago, the building generously donated by Joe and Loretta Scott at 100 N Tucker Blvd will soon be host to more than 1,000 full-time and part-time students and more than 70 full-time faculty. For students and faculty with cars, the building contains a 3-story parking garage. For everyone else, the 8th & Pine MetroLink station is little more than a quarter-mile walk away. SLU also has tentative plans on running Billiken shuttles every half hour between its main campus and the downtown Law School building. 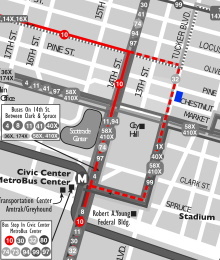 Possible reroute of the 10 Lindell to serve the SLU Law School downtown. But instead of paying for the cost of a shuttle, SLU should invest in Metro to help increase the frequency of the 10 Lindell bus line. The 10 Lindell currently runs every half hour and runs from the Central West End transit center down Lindell and Olive to the Civic Center station downtown before proceeding into south city via Gravois. On its way between the two MetroLink stops, it travels directly past the length of the main SLU campus and within two long blocks of the new Law School building. With help from SLU, Metro could conceivably increase the frequency of the 10 Lindell from every 30 minutes to every 15 minutes (the 10 Gravois portion of the route would continue to run 30 minutes). Rerouting the bus two blocks east from 14th St to Tucker Blvd would also help encourage use of Metro buses by putting the bus line at the Law School’s front door.1 Buses that run 4 times every hour would be a boon for not just SLU students, faculty, and staff wishing to travel to the Central West End in addition to the Midtown and downtown campuses, but for everyone else who uses or depends on the 10 Lindell for getting around St. Louis. Update: As pointed out by a reader, I can’t find any reference to where SLU said they would run a shuttle every half-hour. Nevertheless, even if SLU only ran a shuttle once per hour, the point remains the same. The 10 Lindell currently takes 29 minutes to travel between the Central West End and Civic Center transit centers. The line’s 30 minute headways mean that any small route deviation that increases the route’s length may necessitate the addition of another bus and driver, thus increasing operating costs. Yes, this is a better idea. When the Cross County line opened up Wash U started giving every employee and student that wanted one a pass for the buses and trains as well as have Metro run buses in place of its shuttle service. So for Wash U people they got to ride the whole system for free and for everyone else there was more bus service. The Metro buses are higher capacity than the shuttles and their schedules don’t get cut when school isn’t in session. This approach logically makes more sense. We do not have to try and “re-invent” the wheel. Smart people, leverage and use existing systems to maximize their success and minimize their cost. It becomes a win, win for everyone. Direct access to SLU Law school and the Municipal Courts/City Hall? Stops in front of a newly renovated Central library? Makes too much sense not to do. But then again, St. Louis is a city where every other bar seems to have its own ‘Gameday’ shuttle, so why wouldn’t SLU? An investment by SLU in the Olive/Lindell system can only help people overcome their odd fear of city buses. And more frequent routes mean more eyes on the streets which means — say it with me now — more potential investment in Downtown West!